Answer: World's biggest fish tale? This wasn’t THAT hard of a problem, but I try to mix up the level of difficulty to both give you an idea of additional search skills and to make these challenges accessible to beginning searchers as well. 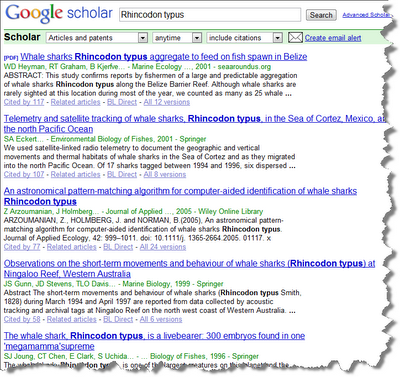 For this fish tale, the easiest way to start would be to use Google Suggest to give you a few hints about where to look. 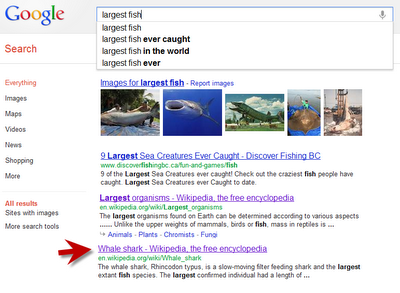 So to begin, I just started my search for [ largest fish ] and then paused for a moment. Google “Search as you Type” kicks in and shows me a list of suggestions and a set of results for that query. Note that all I did was pause, and the suggestions show up automatically. If you look at the 3rd result, you’ll see something about a “whale shark.” Curious, I click on that and quickly find the Wikipedia page which tells me that whale sharks DO grow to the claimed length. 12 meters? Easy. Girth of 7 meters? Also easy. Here’s a photo taken of the coast of Peru that gives you the scale of the fish. 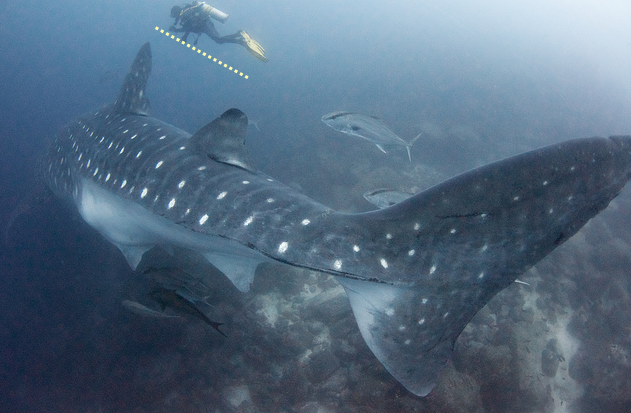 Since we know that whale sharks also frequent the coast of Belize, the size measurements seem VERY plausible. (Here, the yellow dotted line is one scuba-diver length--say 7 feet or so). And for finding a map? 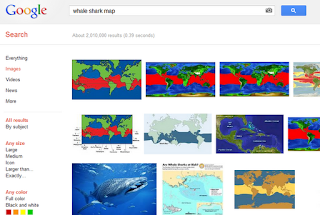 The simplest way is to do the obvious search in Google Images for [whale shark map] which will give you a wide selection of maps to choose from. This map from the WhaleSharkProject is fairly typical, but it's so low-res that it basically suggests they live in the tropics. While true, that’s not especially specific. What if we wanted more precise data--actual sightings, for instance? Unfortunately, getting exact locations is a tougher job. Distribution maps tend to be large scale. So to create a highly accurate sightings map, you’d have to aggregate multiple maps together. And that's a job that’s a bit beyond the scope of this post on my Belize vacation! If you create one, let me know and I’ll post it as an update! Wednesday search challenge (4/25/12): World's biggest fish story? 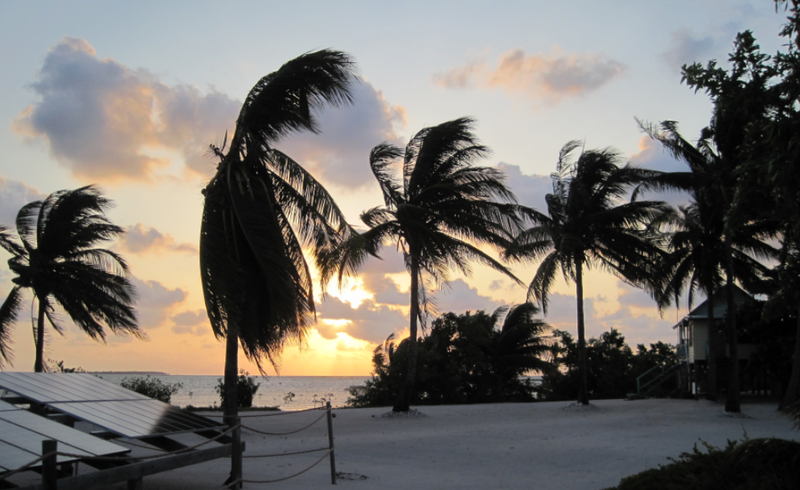 This week I’m a volunteer at the Glover’s Reef Research Station in Belize. I’m here with a bunch of folks to help out the researchers by counting the local numbers of lionfish and measure sea turtles (both population and sizes). It’s pretty interesting work and leads to some tall tales in the evening. After dinner, we were sitting around swapping fish stories. One of the old salts told about seeing a fish that was 10 meters long. That's a big fish, but his buddy claimed HE saw one that was 12 meters long and at least 7 meters across. Should I believe these stories? Given that fish are somewhat hard to tell apart, what’s the current best method for estimating the number of these fish? (Extra credit) Can you find (or generate) a map of these fish worldwide? How many do the researchers believe there are? Enjoy your search while I dive! Answer: How many people cross the waters? If you already know that Logan airport is in Boston, then you can save a search step or two. But if you don’t, you need to first lookup [Logan airport] and figure out that “crossing the water” means getting from the airport (which is out in the bay) to the harbor on the mainland. 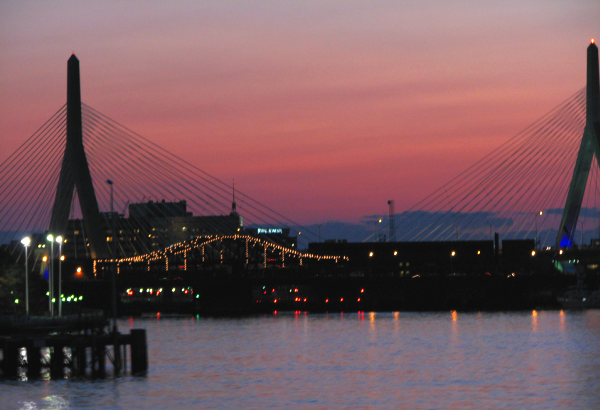 But once you know that, you need to figure out how to get from Logan to Long Wharf. 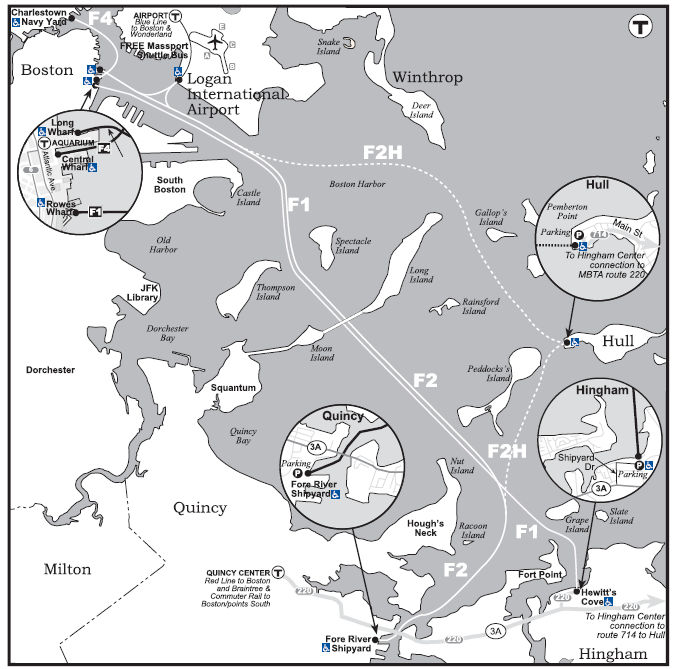 The simplest search for that is probably [water transportation Logan] (or [Logan to Long Wharf water]). 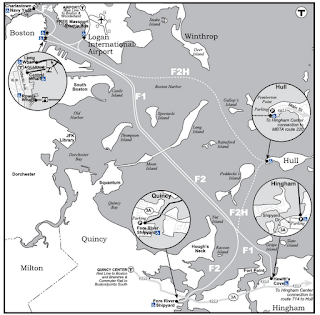 Like most readers, I found the Wikipedia article on the MBTA boat system (who knew there would be a Wikipedia article on that?). 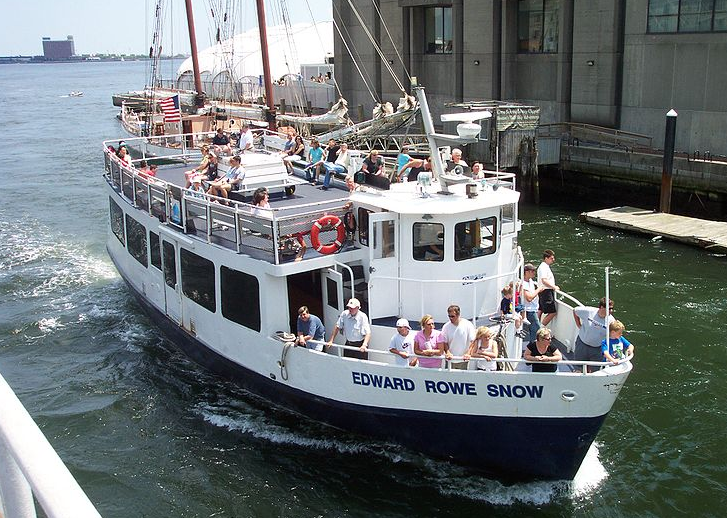 That source suggests that in 2005, the MBTA boat system (which is only 4 lines, all in Boston Harbor) carried 4,650 passengers / weekday. That’s good, but I wanted to dig a little deeper and see if I couldn’t find something more recent. A bit farther down the SERP I found a data point of 1.3M/yr (= 3.5k/day) from this report by“Save the Harbor” and “Save the Bay” (with the cooperation of the City of Boston). But it’s from 2004, and I thought I could find something a bit more official. All of this lead me to discover that there is a document put out by the MBTA (which owns the boats) called “Ridership and Service Statistics--2009” I knew I could find one from 2009 (which includes the data from 2008) In this tome you can find (in section 5)the data: “Total Ferry Ridership by FY,” showing a slight decrease between 2007 (1.40M) and 2008 (1.29M). But if you read the document carefully, you'll find the section where they've broken out the average weekday ridership traffic! The MBTA's number for 2008? 4.4K/day. But now that I know this kind of document exists, I can search for the most recent edition, which turns out to be from 2011… but only includes ferry data from 2008. The search is obvious now: ["ridership and service statistics" MBTA 2011] In that document from 2011 you’ll find the total ferry ridership is back up for 2009 (1.5M during the year). Search lessons: As in many cases, you first have to figure out what the language in-and-around a topic needs to be. When I posed the question, I specifically didn’t say the words “ferry” or “water taxi” (or even Boston). All those parts had to be looked up if you didn’t already know them. Younger searchers (especially those in California) might not know anything about where “Logan” is, so they have to find that as well. And once you know that a particular KIND of official data set exists (the MBTA’s “Ridership and Service Statistics”) you can go download the latest edition. Armed with a bit of terminology and the tactic of looking for the latest edition, you are a powerful searcher! 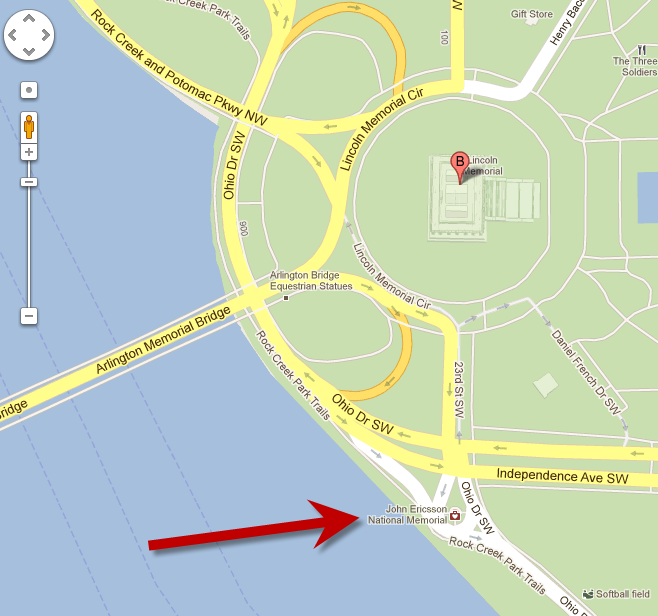 Wednesday search challenge (4/18/12): How many people cross the waters? I fly in and out of Logan Airport fairly often. One of the ways I get from the airport to downtown is by taking a small boat across the water to my destination on Long Wharf. Amazingly enough, the city actually operates a small armada of vessels to move people around the area. 1. Figure out what this little fleet is called? small set of boats on an average weekday? As always, be sure to tell us HOW you found the answers and HOW LONG it took you to find out! What was I doing? I was innocently reading a book about Washington DC when I ran across this remarkable story. The phrase in my book seemed intriguing was this: “The Myrtle of Venus with Bacchus’s vine.” What’s this all about? A quick search on [“The Myrtle of Venus withBacchus's Vine”] leads me to find that this was a line in an 18th century drinking song, “To Anacreon in Heaven.” And it’s not just any tune, that was the original tune for the Star Spangled Banner! So... “In Anacreon…” was the tune to the Star Spangled Banner, lyrics written by Francis Scott Key. Now I had to figure out the connection to the insanity defense. A couple of quick searches combining “Myrtle of Venus” with “insanity defense” didn’t seem to be very profitable, so I changed my search to combine the title of the song, “To Anacreon” and insanity. I then searched for [defense by reason of insanity star spangled banner] to find an interesting reference to Philip Barton Key, son of Francis Scott Key. Maybe that’s the connection! 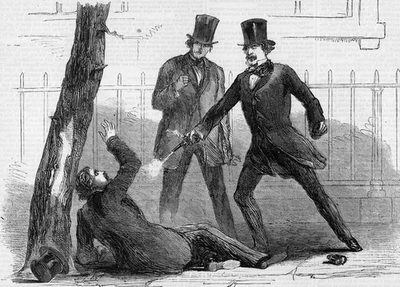 As a few readers suggested, perhaps the best book on Sickle's amazing, checked and complicated life is Thomas Keneally's American Scoundrel: The life of the notorious Civil War General Dan Sickles. After this rather tawdry affair, Sickles went on to become a general who fought, rather badly it seems, at Gettysburg. The first source I found was the always entertaining Straight Dope column, -- but of course I triple-checked this with a few other sources. And along the way I found a rousing rendition of “To Anacreon" by the Georgia Tech glee club. They give it a performance that seems stylistically compatible with early American drinking songs! Overall, this challenge was slightly harder than most, with respondents taking an average of 10 minutes to solve the challenge. Search lesson: Sometimes problem have to be broken down into their parts for solving. In this case, you had to figure out what “The Myrtle of Venus” was all about, THEN figure out what connection that might have to the “insanity defense.” Trying to solve this all in one giant search is barely possible (but it’s much faster to break it down into components first). Wednesday Search Challenge (4/11/12):What's the connection? I know, I know--this sounds crazy. But there's a good story that connected these two very different concepts. I happened to run across this unexpected connection while reading up about the central idea that links these two. Can you figure out what I was reading about? That should be all the clues you should need to figure this out. 1. How long it took you to find the answer. 2. What your search strategy was to get from the clues to the answer. An important strategy is to first ask yourself this basic question: "Do I really understand the question?" It turns out that a huge percentage of all the search mistakes I see are because the searcher hasn't really thought about their question very carefully. Sometimes it's just because they haven't thought through the details of what they're asking, but more importantly, searchers often miss the most important features of their search question because they're not paying attention to what the Search Engine Result Page (SERP) is telling them. 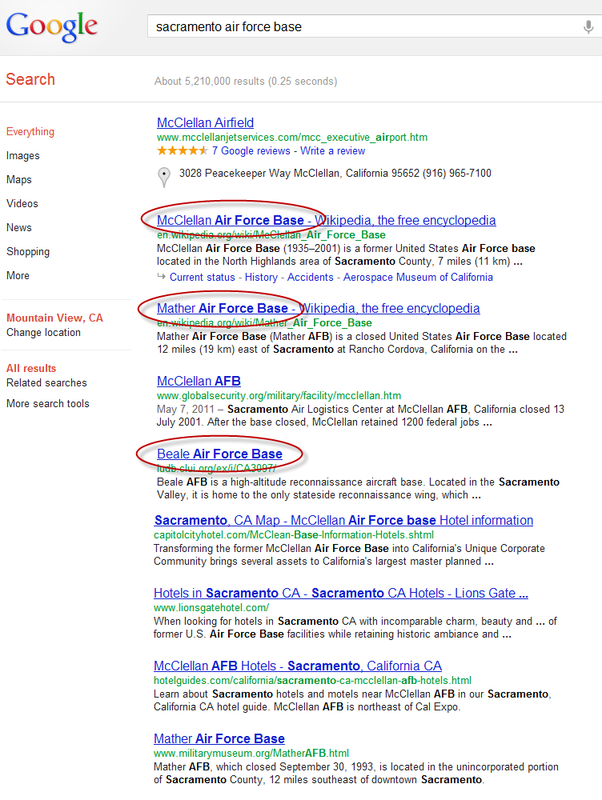 Example: A student asked me in a class the other day, "When did the Air Force Base in Sacramento open?" The obvious query might be [ Sacramento Air Force Base open ]... but that's assuming a bit too much. As you can see, the first result on the SERP looks like it's got the answer there. Game over, right? The better strategy is to search a bit more broadly at first and discover if your question makes sense. It's often true that there's more to know about a topic than is obvious at first blush. 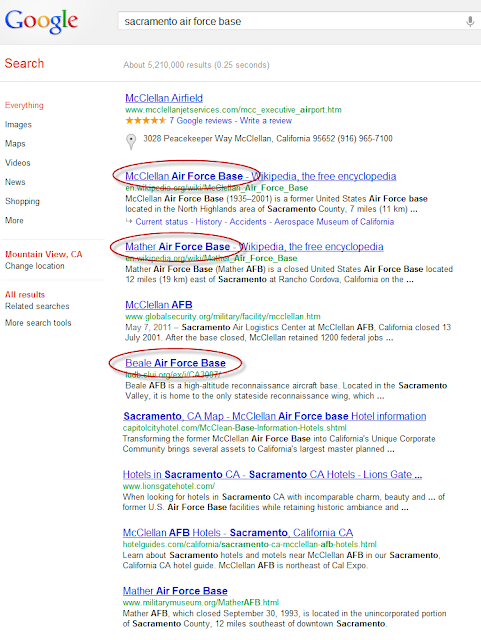 If instead the searcher would have done a slightly broader search such as [Sacramento Air Force base], then they would have seen the following SERP. Note what I've highlighted here. As it turns out, there isn't just ONE Air Force base in the Sacramento area, there are several. I've put ovals around McClellan, Mather, and Beale, all bases that can be plausibly considered to be in the Sacramento metro area. An experienced searcher knows that reading the whole SERP is a great way to get an overview on the topic at hand. (2) reading only the first result and not learning anything from the rest of the SERP. 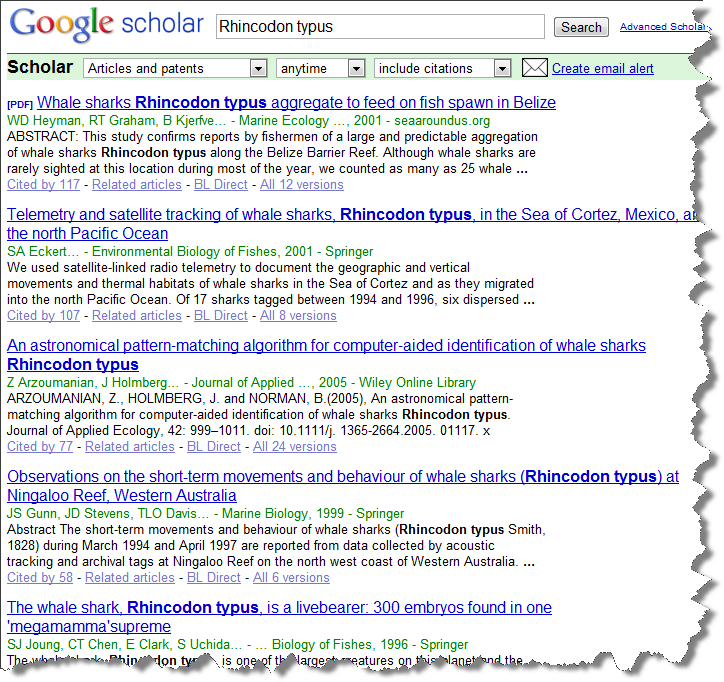 One of the great properties of a search engine is that automatically creates a kind of overview on a topic. Use that overview to your advantage. Does the framing of your question really make sense? In this case, the student's assumption was that there was one-and-only-one Air Force Base in the area. That wasn't true. As an extra hint, consider reading through the related searches list that appears at the bottom of the SERP. Note that there's another Air Force Base (Travis) that people who are interested in Sacramento area bases have been looking for. Travis turns out to be about 40 miles southwest of downtown Sacramento... so it might also be a local AFB. Keep looking at the WHOLE SERP! Quick answers: The sculpture in the teardrop-shaped traffic island is for John Ericsson, the Swedish inventor of the Monitor (an ironclad fighting ship in the US Civil War), the twin screw propeller system, and one of the first torpedoes. Quick extra credit answer: The sculptor of his monument was James Earle Fraser, a prominent sculptor of the time who ALSO designed the Navy Cross, the highest ranking medal in the Navy. 2. Zoom in on the island and see the label popup identifying this as the “John Ericsson National Memorial.” That led me to search for [John Ericsson] and thence to the Wikipedia (and several other) articles about him. As several readers pointed out, Fraser also sculpted the buffalo nickel, a coin that numismatists know well. This wasn’t that difficult of a problem (although note that I once again changed the image to be visually recognizable, but not useful in Search-by-Image). And it’s interesting to note how many people recognized the deck of the Monitor straight away. I’m going to have to come up with some more challenging tasks for you folks! 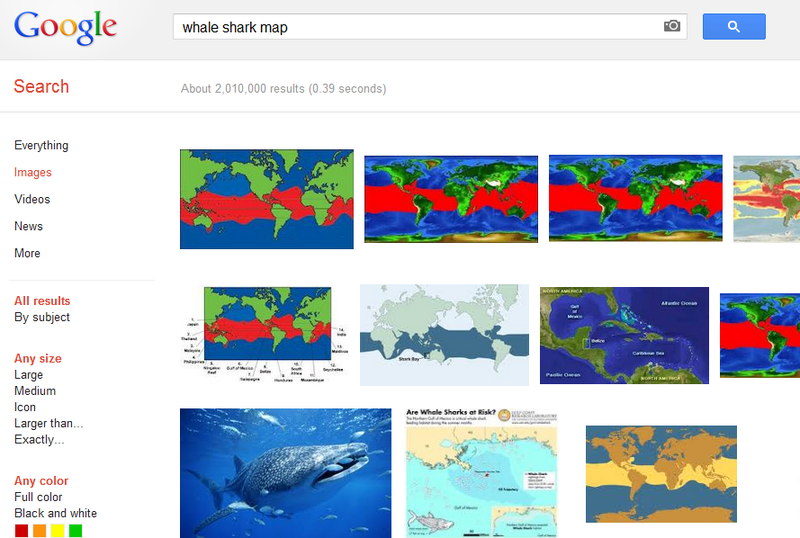 Search lessons: (1) Visual recognition helps a great deal in doing searches for things described as "teardrop-shaped." You might get lucky searched for such a phrase, but don't count on it. (2) When searching for associations between things (such as between the the Ericsson memorial and the Navy Cross), it's often best to put in just the two things you're looking for and let Google do the heavy lifting. I COULD have tried to guess that it was the sculptor who was the connecting idea, but if that wasn't right, I might have wasted a lot of time checking down dead-ends. If you just put the two ideas side-by-side in a query, Google will automatically search for the relationship for you. If you have a few moments, it's worth reading about Ericsson, who was a remarkable polymath and inventor during the mid-1800s. His engineering work and life in general are remarkable. 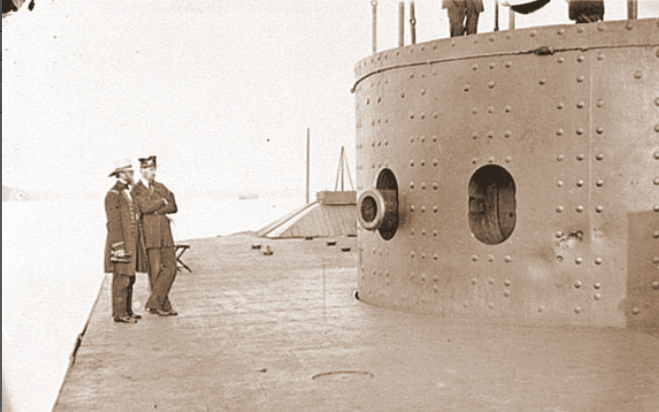 He not only designed and built the Monitor, but also the pivoting gun turret (still in use in modern warships), a kind of external-combustion engine that competes with the Stirling engine, electrically run torpedoes... it goes on and on. Wednesday search challenge (4/4/12): Find that monument! I’m in Washington DC this week, chaperoning a group of 8th graders around this town full of remarkable sites, remarkable people, and remarkable stories. Who is the man commemorated by the statue in the tear-drop shaped island? And once you’ve figured that out, can you figure out what two navy-changing inventions he’s known for? For extra credit, what is the unexpected connection between this sculpture and the US Navy’s highest decoration?